Snack Girl does not enjoy flaming food products. I would much rather find food that is good and champion it. But, I looked at my review of Lunchables and realized that it was outdated. I needed to take a fresh look at Oscar Mayer’s products to give them a chance. The truth is that they have gotten worse than when I checked them out two years ago. How is that possible? The Lunchable I reviewed had peanut butter, jam, whole wheat bread, and a cup of fruit. 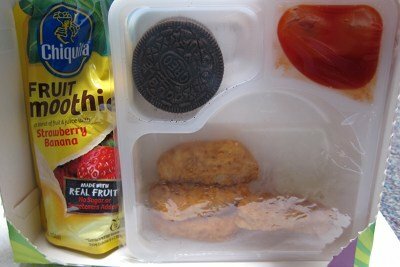 Okay, now there are Oreos, weird chicken things, ketchup, and a fruit smoothie. Does this look like food to you? It cost me $3.75 versus the $2.50 I paid in 2011 and there is a blatant lie on the packaging that I would challenge if I was a lawyer. The smoothie wrapper says that it has “no sugar or sweeteners added”, but the ingredients list includes “apple juice concentrate” and “orange juice concentrate”. What do you think happens when you concentrate apple juice (remove the water)? It turns into apple flavored sugar syrup! I don’t see how “apple juice concentrate” isn’t a sweetener. Sugar: The sugar content, 35 grams, is almost the same as a 12 ounce can of Coke. Cost: These cost $3.75. I know I can make a lunch for less than that. Packaging: There is way too much of it and it is not reusable. 590 grams of Sodium: Twenty-five percent of your daily amount in your kid’s lunch. Artificial flavors, MSG, high fructose corn, syrup, preservatives... We can feed our children better than this! 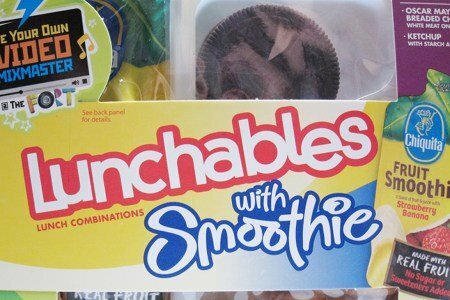 The other lunchables in the case had Capri Sun juices and candy included (like mini chocolate bars). Why would you buy this to nourish your child or yourself? Who is buying these? At a price tag of $3.75 it costs more than my child's school lunch ($2.75) and looks much worse than the school food (and that is saying something). I can't imagine that people who are struggling to make ends meet are eating them. My guess is adults and people with disposable income. Anyone else want to hazard a guess? Generally speaking, I avoid processed foods but anything with high fructose corn syrup or hydrogenated fat is a low quality food--end of story. I am fortunate in being retired to have plenty of time to prepare meals but surely even the busiest parent can do better than this for their children. My kids ask for them because they see the commercials and I tell them exactly why I won't but them, nothing but sugar and crap!! Oh my gosh! Glad I don't buy these! How horrible!! My kids want them too and I don't buy but I have started making bento box lunches that are fun, portion controlled, and are filled with fruits and vegetables that look like flowers and bunnies and things. You tube has great suggestions. I keep it simple with veggie cutters but my kids still love them and the lunchable kids are jealous of my kid's lunches! :-) I now can make cute bentos in less than 10 minutes! My Wednesdays are really busy. I work from 8-5 and then have a class from 530-830 (which I am often late for because I am rushing out of work and almost never leave at 5), and I will say that yesterday I took a lunchable to eat on the ride from work to school. Usually I eat an apple, a 100 calorie pack, or a not-much-better-than-a-lunchable nature valley granola bar, but I find that an hour before class is over I am ravenous again. I have 3 girls that want these all the time. I keep telling them that for almost 12 dollars, I could buy the stuff to make my own 'lunchable'. The difference being, they would get a larger quantity of food and it would taste so much better. I'm not sure if you have posts about packing kids lunches. I'm rather new to your blog but I am considering bento boxes this summer. Do you or will you post any thing on kids cold lunches? I'm a single Mom on a tight budget, but I do my best to pack wholesome lunches for him. she uses bento boxes and is very VERY creative, and her suggestions are tested by her kids! Every day I see lunchables at lunch and now snack time in my kindergarten class. It's peer pressure, even at that early age. Once in a while, a kid who usually eats healthy will have one, take a bite and refuse to eat the rest, but that's rare. Unfortunately, they are considered a big treat. So, to counter this subtle advertising, I do a thematic unit on healthy foods. I have been raising my 7 yr old grandson since he was about 18 mos. old and am trying to do a better job food-wise than I did years ago with my own kids. I worked full time and went to school part time while raising my kids and thought I never had time to fix "healthy" meals. I remember when Lunchables first came out and my kids begging for them, which I of course bought (and back then, in the beginning, they were probably tons healthier than they are today....but still crap!) along with a LOT of other processed foods and fast food. Today, both my kids are in their mid-20's, constantly battling their weight and their addiction to junk food and soda. My grandson? When given the choice of Goldfish crackers or maybe a cookie for a snack, asks instead for tomato slices with a little fat-free ranch dressing to dip them in, or some cantaloupe, or some string cheese. Seriously. That tells me that if they learn to eat good from the beginning, they tend to prefer it and will (hopefully) stick with it for a lifetime! I totally agree with you. I have twin girls. One of them is always wanting lunchables. No matter how many times I've explained why I don't want to buy them, she still wants them. Funny thing is, when she packs her own lunch she does pretty good, health wise. My other one will only eat the meat out of them because the cheese tastes gross and she doesn't like the crackers. She would rather have me cut up cheese, salami, and put some crackers together. Just a FYI - regardless of where they are bought they are a waste of money. HOWEVER, I have NEVER bought them full price. I would buy them on sale or what is even better (price wise) is Grocery Outlet. Again, no excuse but they would be under $2 usually. I would LOVE some good nourishing ideas for kids lunches. The many things I've seen online and tried with my kids, who are not what I consider picky eaters, have failed. We are far from perfect in our household about food but we are constantly trying to improve and find healthier choices that still fit into a very buys (10 min to get out the door) type schedule. I recommend the Greenlites bite website that Jeanne referenced above. She has excellent suggestions for kids lunches that her kids eat! OMG that's all the "food" you get for that money. I never buy the big ones because they never have enough food and they are expensive. I will admit to buying the small ones w/ just the crackers, cheese and meat occasionally for lunches or snack for something different. This is the 'new food group' formulate--sugars/ fats,sodium,and cholestrol. The fault is with--food products, merchandising/advertising,the consumers, and 'spoiled chidren'--it is always all about the money,it is the advertising that sells with the hope that the unaware buying public will cave into packaging slogans and the idea of a quick and easy lunch-to-go. Your health is not their priority. Buyer be wise. Parents you are in charge. What has happened to the brown bag lunch? With a little planning getting back to basics--veggies, grains,and lean proteins--does not have to be borning. "An apple a day keeps the doctor away . . ." Be strong, be healthy,live longer, and be happy, too!